The white blob on the right is my T-shirt. I’m the only cyclist in the bike box. Every time. 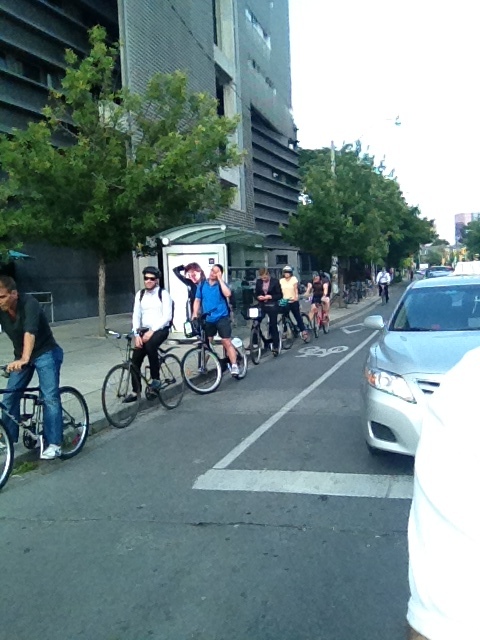 My fellow-cyclists of Toronto, dare I try to read your minds? Canadian to the core, no-one wants to look impolite, aggressive or pushy. No-one wants to look like they are trying to get off first at the lights. So what do we do? Line up as if there were no such thing as a bike box. This entry was posted on Thursday, September 20th, 2012 at 1:26 pm	and tagged with Advanced Stop Lines, ASL, bike boxes, toronto and posted in Uncategorized. You can follow any responses to this entry through the RSS 2.0 feed. Love the cultural psych analysis!